This first polish is from the recent What Really Happened In Vegas Collection. Accidental PPV is described as a silver holographic polish, accented with glowy blue shimmer and a subtle turquoise flash. None of which I managed to capture in my photos. The holographic effect is subtle and I see more of the blue shimmer in person. This polish applies nicely, but you definitely want to allow each coat to dry completely before applying another to avoid drag. I swatched three coats below. Too Hot For Pants is also from the What Really Happened In Vegas Collection. This one is described as a fuchsia-red jelly, loaded with red and fuchsia shimmer and holo micro glitter. It is certainly loaded! This is a perfect, two coat polish with amazing depth. Seriously Sassy is a blogger collaboration shade with Sassy Shelly that is simply amazing! This purple jelly base is loaded with a blue to purple shifting glitter. The result is an incredible, blurple polish that simply must be seen in person. I swatched three coats below. If you decide you need this beauty, don't let the first coat fool you. That first coat is blotchy and crazy uneven, but it builds for perfect coverage. This next polish is part of the Fall 2013 Collection, and is quite gorgeous. Bird Is The Word is a magenta purple holo shimmer. I found the holographic effect to be subtle in this one but the color is gorgeous. The formula is excellent. I swatched three coats below. Finally, What The Deuce? is also part of the Fall 2013 Collection. This one is described as a kelly green holo shimmer. The holographic effect is subtle in this polish as well. The color, however, is a beautiful bright green. Formula is also perfect. I swatched two coats below. 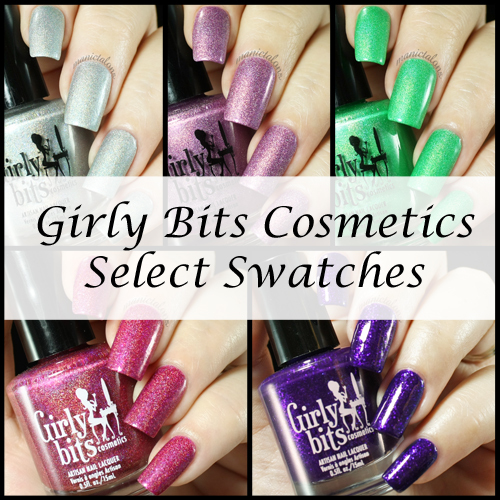 *The polishes featured in this post were provided by Girly Bits Cosmetics for my honest review. Love the blurple. Very rich. Was complete? Do you know what causes it? With regular polish or with gel? I haven't experienced it with regular polish but with gel polish it usually means either the top coat didn't fully cure or the tacky layer wasn't fully removed.